Depending on the design, Heidi will help you fabricate your rings in gold or carve them in wax to then be cast in the metal of your choice. Some designs are best executed directly in metal and can be fabricated in our studio. 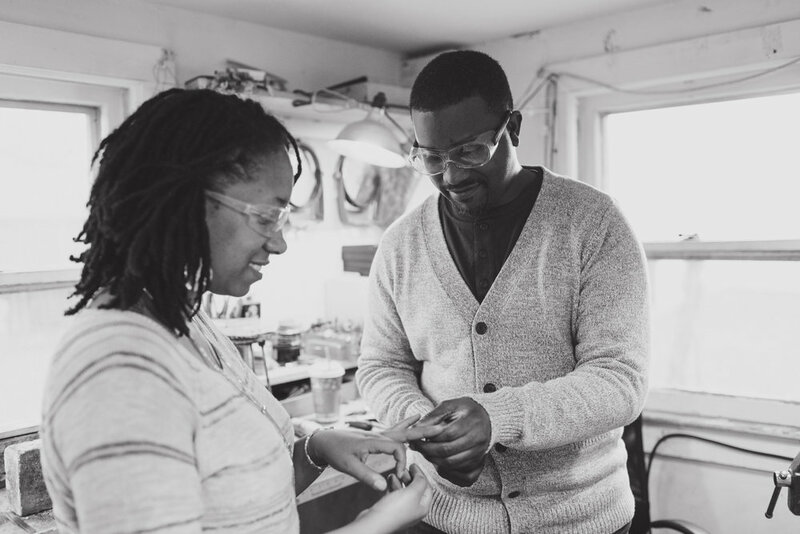 In this case, couples will learn basic metalsmithing techniques such as sizing, sawing, forming, soldering, and finishing. Couples will leave the studio with their lovely rings in hand! Some designs are better executed through the process of lost wax casting. For this two-part process, couples will visit the studio twice. During the first studio session, we will measure your finger and carve your rings out of wax. Heidi will then send the rings to her caster, who will cast your rings in the metal of your choice. After casting, we will meet in the studio for a finishing session where couples will learn to file, sand, and polish the rings. You will leave with these little treasures in hand! Your rings can have a hammer texture, satin, or polished finish. Stones can be added by Heidi after making the rings. All metal is responsibly sourced and all stones are ethically mined and conflict free.